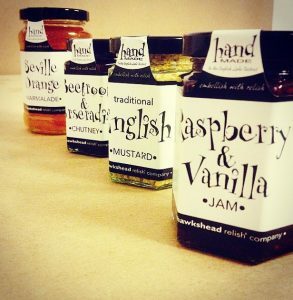 The Hawkshead Relish Company is a small family run business based in the Lake District. Mark and Maria started making relishes, chutneys and preserves to serve alongside their dishes in their busy village café. However following the Foot and Mouth epidemic of 2001, they were forced to diversify. Creating more of their delicious chutneys and relishes to sell seemed the obvious choice. Within a few years, they closed their cafe to concentrate on full time production and were winning awards and accolades from their products. In 2005 they received the coveted “Specialty Product of the Year” award from the ‘Great Taste Awards’ and in 2007 moved their production to a 16th century restored cruck barn, just south of Hawkshead, ensuring long term employment of their small but dedicated workforce. Many of the delicious chutneys, relishes and jams that we use at Greens, are supplied by the ‘Hawkshead Relish Company’ where we also sell ‘take home jars of all the jams and relishes on our menu.